If you after a sleek design and sound quality performance then look no further! 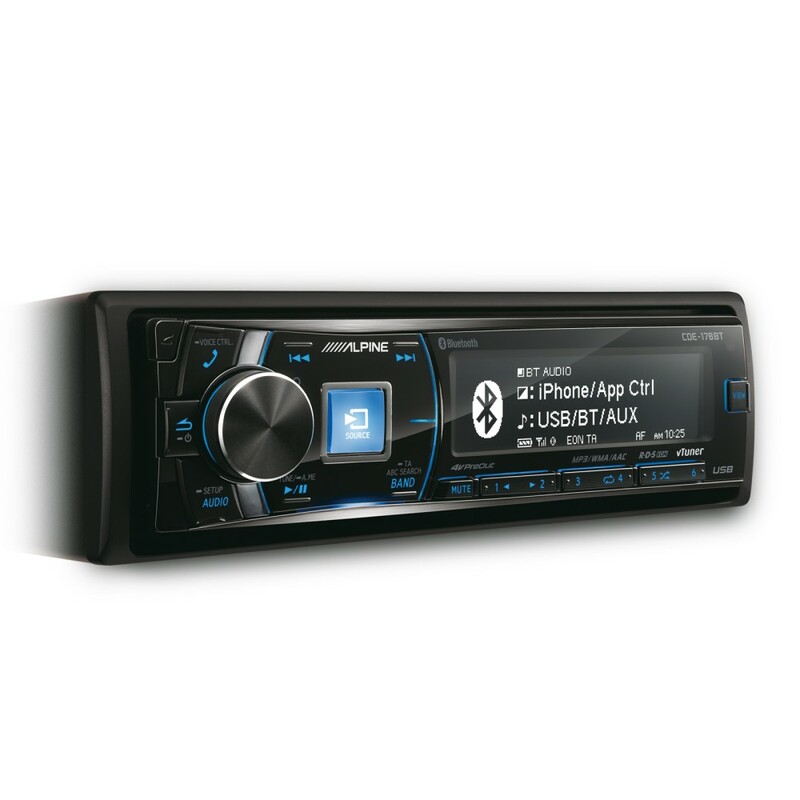 Alpine’s flag ship CDE-178BT offers a multitude of features and sound tuning to get the highest resolution out of your CD’s, USB or Music streamed audio. 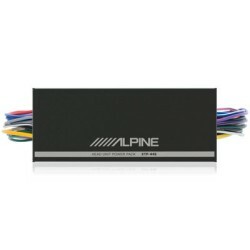 The CDE-178BT is the top-of-the-line of the Alpine Head Unit range that combines all the cool new features and functions such as TuneIt compatibility for iPhone and Android based phones, allowing full sound tuning and sharing via your phone, as well as new Facebook message alerts. It is also compatible with the vTuner for Alpine iPhone app, giving you thousands of internet radio stations with control from your Head Unit. BassEngine Pro means top quality sound with a 24-Bit DAC and the high resolution display ensures best visibility in any lighting conditions. It’s Steering Wheel Remote Control Ready and Vehicle Display Interface Ready, for a perfect install in almost any vehicle. If your car is equipped with a start-stop engine, this Head Unit is even more interesting for you, since it will keep playing when your engine stops at a crossroad. Frequency Response: 5 - 20k Hz (±1 dB) *May differ depending on the encoding software and bit rate. "vTuner for Alpine" is currently not available in the iTunes store. Does what it says in the box! However, no adjustment for Midrange only Tweeter and Sub levels can be cranked up. Excellent Bluetooth phone. I have ordered 2 of these units recently and my experience with them over the last few months has been mixed, the first cde-178bt i ordered was perfect, the second wasnt quite, the microphone didnt work and the auto dimmer caused the screen to flash constantly when the headlights were on. (no poor connections,the headunit just doesnt register low power dash illumination very well). This has easily been sorted by keeping the dimmer on permanently. The dimmer function doesnt really dim much at all, even on its lowest setting its still very bright. The sound quality is excellent, bluetooth connection easy and general build quality is good (except the one bad microphone i had). The CDE-178BT does support multiple Bluetooth connection. See the below link for full specification. I know this headunit is getting on a bit now - does it support the latest iPhones with Bluetooth and the Tuneit app? Also, can you add a DAB tuner on to it? yes it does support the latest iphones via bluetooth and works with the tuneit app. The vehicle is an American RV. I have an iphone on Bluetooth but also use an iPod classic for more music. Can I easily connect both? I have a e46 330cd with Harmon Kardon. Will this head unit work. If so have you the adaptor and steering wheel adapter too? 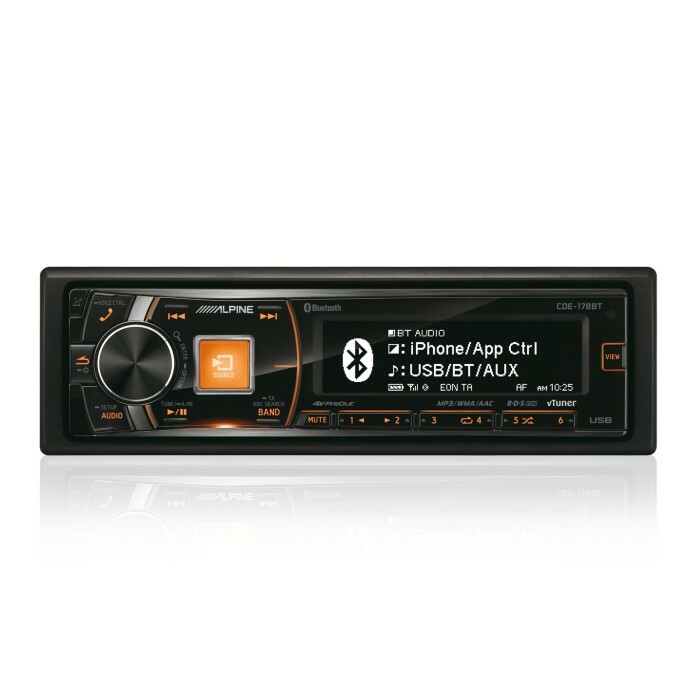 The CDE-178BT can be installed in your BMW E46. You will need the following accessories for installation. Can a hard drive plug into this, if so what is the max capacity? Does it come with a USB mount to mount say in the glovebox or something? You cannot plug a hard drive to the CDE-178BT. There is no mount supplied with the unit. it will come with a standard USB lead. YO will need the below steering control and aerial adapter. Hello - please can you let me know if the stereo comes with a 1 or 2 year warranty? Thank you, Vicki ps if I order this tonight/tomorrow, when should I expect to receive the item approx? The CDE-178BT can be installed in your Vauxhall Astra. 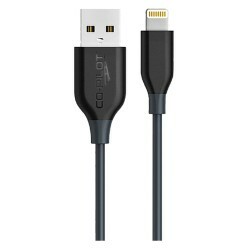 You will need the below listed aerial adapter for installation. I have an alpine cde130r fitted. Is this a simple swap over to this Bluetooth version? It will be a simple swap over. I have the 2008 Seat Ibiza Sportrider - please are you able to advise which extra bits I would need to install this unit and maintain steering controls? You will need the below listed accessories for installation. Hi I have a bmw 1 series coupe 2010 118d and would like a alpine single din but what have you got to make it fit and look good plz? can you tell me the year of your vehicle, also does your car radio have the silver trim just above it? Please don't put sensitive info in the question.